Supportive mesh back up top, contoured cushion on bottom, and optimal breathability on the back make the Eurotech Apollo Mesh Back Style High Back Chair an ergonomic chair for the ages. 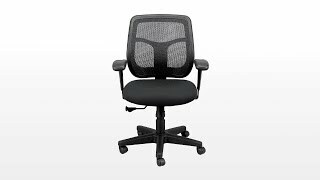 Factor in affordability on the Apollo model MM9500 and you have a unique seating solution that can keep you working comfortably through all of your tasks. Enjoy the best in height adjustability, giving you a better seat for your work style. You can even customize the seat in your choice of fabric for a chair that fits with your exclusive office vibes. The Eurotech Apollo MM9500 is available with a black mesh back and black seat, or your choice of any of these custom fabrics on the seat at a small upcharge. The Eurotech Apollo MM9500 Mesh High Back Chair is available with or without a headrest. All around nice chair: easy to assemble, with lots of adjustments. However, the chair is not designed for small/slender people. If you are a woman, or small man, you may be disappointed (as I was) by the inability to adjust the arms inward toward the seat. Also, if you use a wireless apple mac keyboard, you can't move the arm-rests inward to adjust for the size of the keyboard. The headrest is also limited in it's usefulness for small b/c it attaches to the top of the seat back. It would be nice if it could go lower. Stuck with it now, will make do till i can afford a better chair. $288.00 List Price: $504.00* The list price is the same as the MSRP (Manufacturer's Suggested Retail Price). It may not necessarily be the price at which the product is sold.